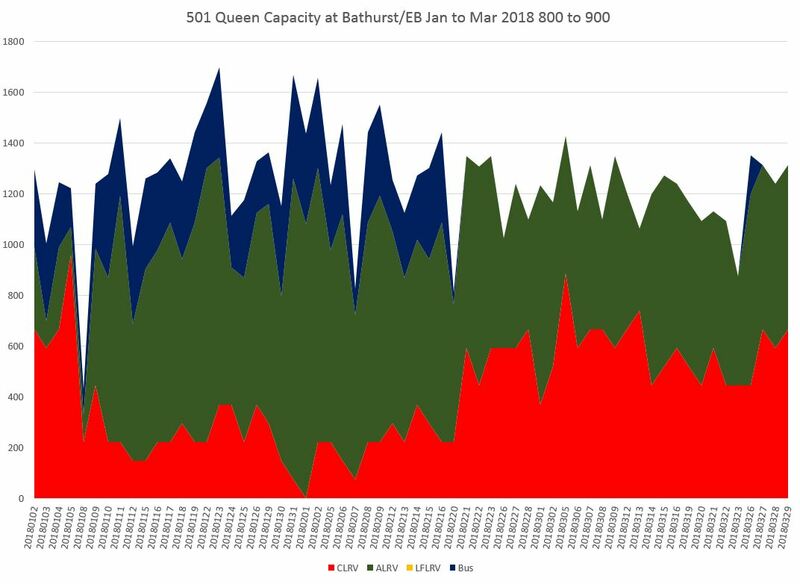 This article arose from a recent Twitter conversation where I was asked whether the capacity of of 501 Queen route had been reduced because crowding appeared to have increased. Crowding has many sources including service reliability (even distribution of demand among available vehicles), scheduled frequency (how many vehicles are supposed to arrive per hour), actual service provided and the type of vehicle used. Past articles have looked at service reliability and running times. The mid-February 2018 schedules brought a formal change to the vehicle type on which the 501 schedules are based. For many years, the capacity alleged was based on the longer ALRV (articulated) streetcars, but the service was actually operated by a mix of the shorter CLRVs and ALRVs. This was due to two factors: the declining reliability of the ALRV fleet, and the desire to increase capacity on 504 King. The new schedule assumes that CLRVs will be the primary vehicle type used, and the number of cars per hour (or conversely the headway or time between cars) has been adjusted to reflect this. 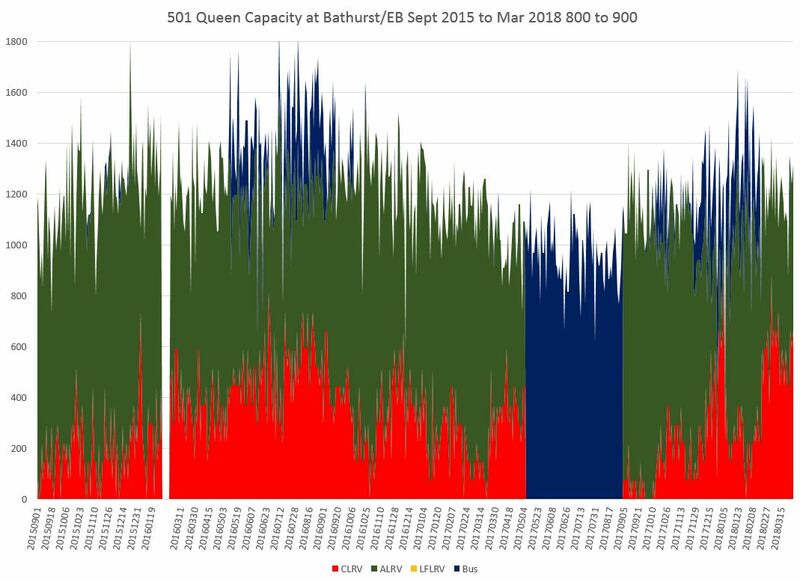 However, a review of service over recent years shows that the actual capacity operated on Queen is at best comparable to that of a few years back, and more commonly is lower with some of the decline being fairly recent. The charts in this article have the same format as capacity charts in my articles about the King Street Pilot, most recently the March 2018 update. Of particular note is that the capacity operated on King has been growing with its transition to the larger Flexity cars, and now regularly peaks above 2,500 per hour, peak hour/direction. The capacity on Queen never reaches 2,000/hour because less service is offered there. 501 Queen service was beset by several disruptions and diversions over the past few years notably a water main and streetscape project west of Spadina in 2016 and 2017, and a series of track construction projects reaching over the entire length of the route from southern Etobicoke to Neville Loop. Another upheaval is planned for 2019 with the reconstruction of the King/Queen/Roncesvalles intersection, entrances to Roncesvalles Carhouse and trackage on The Queensway west to Parkside Drive. There are five sets of charts linked from this article, and each set has eight pages. Of these, the first four present the longer view stretching back to September 2015, and the last four contain the same data, but only for the first quarter of 2018 so that the details are spread out. The sets of four pages show the actual capacity operated for four hours in the AM peak (6 to 10 am) or PM peak (3 to 7 pm). Only vehicles on the 501 Queen route are included, with 502 Downtowner and 503 Kingston Road omitted. The 502, even as a bus service, was notoriously unreliable and did little to supplement capacity especially during afternoon peaks outbound from Yonge Street. The 503 was, for most of the period of this analysis, a peak period service which overlapped Queen Street only between Kingston Road and the Don River. Here are two sample charts. The first shows data from September 2015 onward (except for February 2016 for which I have no data). The colours used indicate the proportion of capacity provided by each vehicle type. For the period in mid-2016 when streetcars operated via King and bus replacement service operated via Queen, both sets of vehicles are shown. The “spikiness” of the chart shows that there can be a huge variation in the capacity actually provided from day to day with values dropping well below 1,000 (the downward white “stalactites”) and rising well above 1,200. The proportion of service operated by CLRVs has fluctuated over time resulting in a loss of scheduled capacity. There is a striking drop in capacity on all charts in early January 2018 when the ALRVs were out of service thanks to the extreme cold. Bus operations through mid 2017 provided a lower average capacity than the streetcars they replaced. A high point in recent operations came in early 2018 with a combination of a larger proportion of ALRVs than CLRVs supplemented by bus trippers. Looking only at recent months, we can see the mid-February transition where the bus trippers were dropped and the scheduled proportion of CLRVs rose. Capacity has not reached the peaks seen before this change. The deep notch on January 8 was the result of extremely badly bunched service, and I will turn to that in detail later in the article. As noted above, there was a drop in capacity at Bathurst when buses replaced streetcars although this varies by time period. Since mid-February, peak capacity during the critical 8-9 am hour has been lower, although it is higher before and after this period. The mid-2016 period when streetcars diverted via Shaw, King and Spadina shows an evolution and loss of bus capacity on the Queen shuttle over the course of the peak period. Although the capacity on Queen at Bathurst due to buses is fairly large from 6 to 8 am (first two charts), there is less contribution by buses in the key 8-9 am period showing how the shuttle service became ragged during that hour, and this continues into the 9-10 am period. At Woodbine, the service shows two markedly different levels depending on whether the Queen streetcars or buses are running through to downtown, or are only providing a local shuttle service to Neville. October 2016 and September 2017 brought track projects that reduced service to The Beach to a shuttle operation, and the capacity provided was much lower than the through operation to downtown. On March 5-6, 2018, there was no streetcar service east of Kingston Road to allow for work at Neville Loop. Tracking data for the replacement bus service is spotty for the days involved, and it is unclear whether the service was simply absent at times, or not reporting. 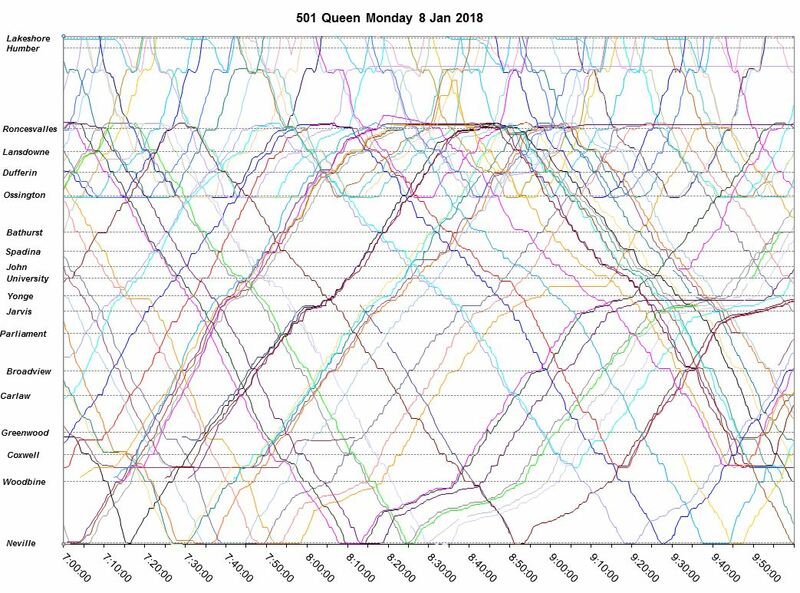 Service capacity after the February 18, 2018 schedule change has improved a bit, but what is quite striking is the number of deep notches in the 9-10 am chart. This reflects short turns at Woodbine Loop which reduce service to The Beach at the end of the AM peak, sometimes quite drastically. Outbound service from Yonge shows the same pattern as inbound service with lower capacity during the bus replacement service in 2017. 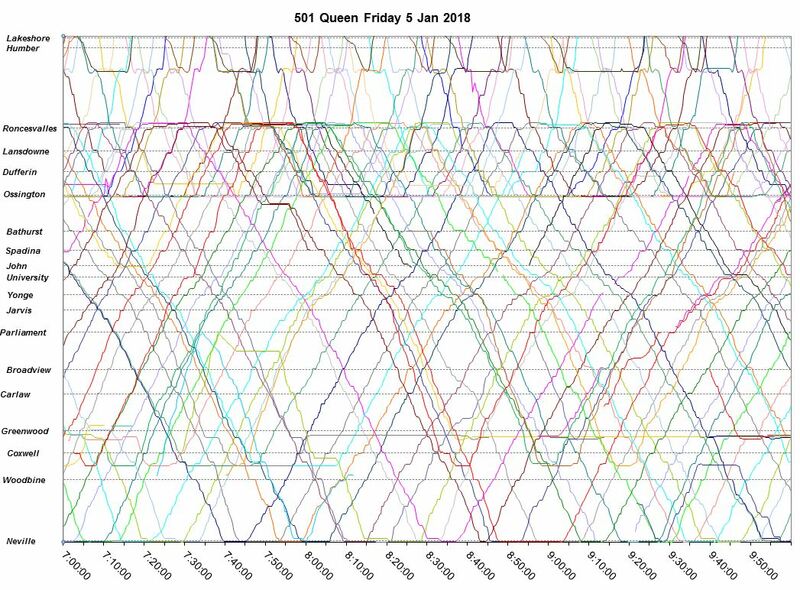 The use of CLRVs on Queen builds up from mid-February onward, although there is a big spike in early January as noted above. There are occasional appearances by Flexity cars in these data. They appear to be test cars that are running signed on to the tracking system, although they were unlikely to be carrying passengers. They tend to show up briefly for a partial trip and then disappear. I have left them in the charts, but their contribution to line capacity should probably be ignored. The weather on January 8 began with snow overnight and temperatures slightly below freezing. This changed to fog and then rain as the temperature rose above zero after the AM peak period. 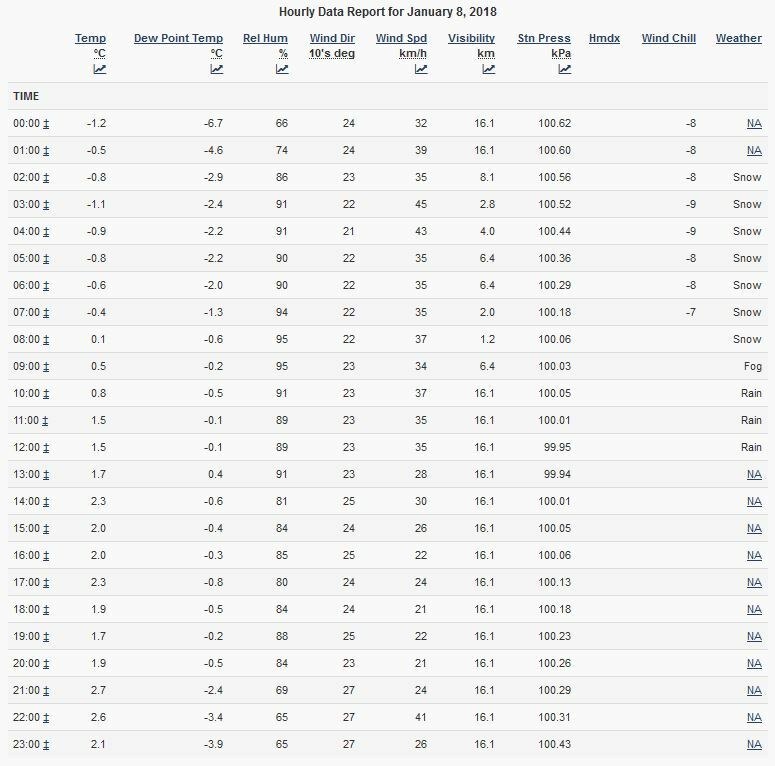 The table below gives the hourly observations at Toronto Island (YTZ) which is more representative of the downtown area than reports from Pearson Airport (YYZ). TTC’s eAlerts for the morning report numerous power outages including on part of the BD (Line 2) subway, but nothing specific was reported for the streetcar network. In spite of the weather, some ALRVs did operate on 501 Queen and they remained in service through much of the day. However, the CLRVs provided most of the trips and service capacity was reduced as a result. The day begins well enough with cars leaving from both carhouses on regular headways. Cars from Russell (between Greenwood and Coxwell) run first east to Neville, while cars from Roncesvalles enter service directly at what was then the western terminus of streetcar operations. Problems start to develop after 7 am when a bundle of 3 streetcars leaves Neville and is joined by 3 buses along the way. This pack travels westward across the route, and is followed by two smaller packs crossing Yonge between about 7:30 and 8:30 am. The service eastbound from Roncesvalles becomes more regular a bit after 8:00 but the big gaps hit Bathurst eastbound during the peak. Only six cars passed Bathurst street eastbound between 8 and 9 am, and one of those was carrying a gap of almost 26 minutes. By contrast, here is the same period from the previous Friday, January 5 when service was much better-behaved. 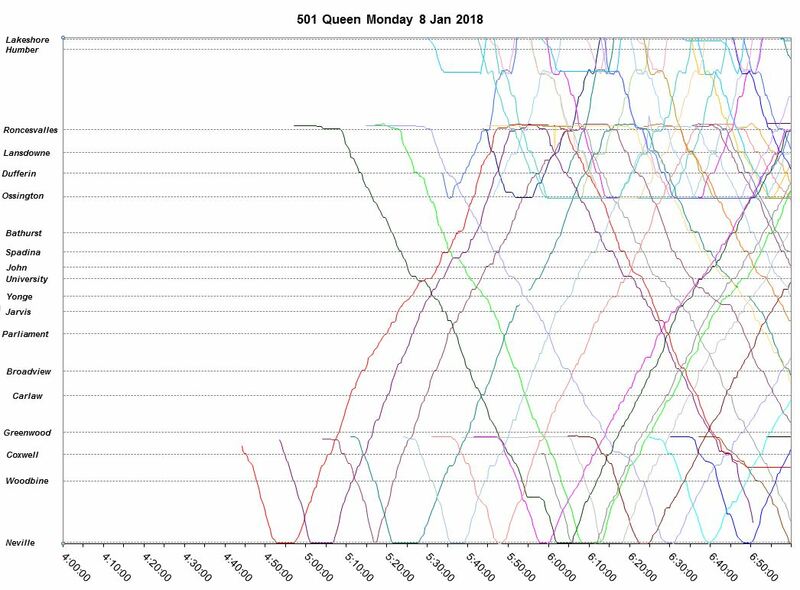 There were actually fewer ALRVs on Queen on January 5 than on January 8. The weather is the culprit together with service bunching on January 8, not the type of car in service. This entry was posted in Queen Car. Bookmark the permalink. Can you provide more details to the above? Can’t seem to find any information on this anywhere. The intersection and both entrances to Roncesvalles Carhouse will be completely rebuilt. The track on The Queensway from the carhouse west to Parkside Drive, including the special work at Sunnyside Loop, will be rebuilt and will become a streetcar right-of-way isolated from other traffic. The intersection at Roncesvalles will be reconfigured by moving the eastbound stop to the farside of the intersection (with a design like that on Roncesvalles). The eastbound Queensway to King channel will be replaced with a conventional right turn, and the sidewalk will be extended to encompass the existing island on the SW corner. Left turns off of The Queensway eastbound at Roncesvalles will have a dedicated lane where the eastbound carstop island is now. Whatever left turns off of The Queensway into streets such as Sunnyside remain, if any, will be controlled by traffic signals. The carstops on Roncesvalles will be modified so that low floor cars can extend their ramps without jamming. This will be done while streetcar service is suspended north of the carhouse during track construction at the north gate. This project has been brewing for a few years, but will finally get underway in 2019. I recall seeing a diagram detailing a minor alteration to the track layout in the south end of the yard. Is that also going to be accomplished during the rest of this major upheaval? Steve: I’m not sure of the exact timing, but the change is part of the overall work planned for the period while operations have been shifted from Roncesvalles to the east end carhouses. I remember when CLRV’s and LRV’s drew increased ridership. ALRV’s have shown their worth. Now, if TTC would return to the good old days of the 60’s-80’s, it would be saying a taste. When I first visited in 1979, TTC and the city had class. Steve: There are times I just leave the text as people write it. More capacity and more transit lanes won’t help if it’s not managed properly. The new schedules for the extended 503 have a theoretical headway of 9 minutes during peak periods yet I saw 2 of them running as a pair the other day with a third 503 running 2 minutes behind its comrades. Steve: Bunching has always been a problem on the 502/503 regardless of which mode serves the routes.